Arsenal, Inc.'s upper and lower handguard set is constructed of high-strength reinforced polymer and offers a modern, weather resistant upgrade over typical AK-pattern wooden components. 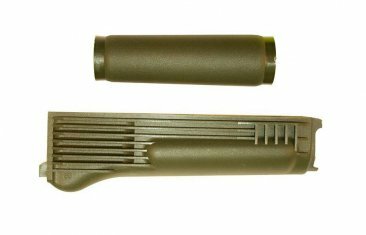 The lower handguard incorporates a stainless steel heat shield and metal insert, meeting and exceeding the mil-spec requirements. They come in matte black, plum, OD green colors and are used on Arsenal's SLR-101S, SA M-5 Series, SA M-7 Series, SAM7R, SAM7UF rifles. These are the only US made mil-spec handguards in the market that are also 922r compliant.